My name is Trish, and I have worked for 180 Medical for 4 years. I was diagnosed with Interstitial Cystitis and Pelvic Floor Dysfunction within the last year. For those of you who are unfamiliar with what this is, Interstitial Cystitis is a chronic painful condition of the bladder. Many of the customers at 180 Medical also share this same diagnosis as me. While I am not yet at a stage in my condition that requires me to self-cath, I thought I could share some of my own experiences and tips. Interstitial Cystitis (IC), also known as painful bladder syndrome (PBS), can often have similar symptoms to a bladder infection. When I initially began to have symptoms, I thought I had a urinary tract infection (UTI) for several weeks in a row. One of my family members has Interstitial Cystitis, so I was already familiar with some of the symptoms. After the second negative urinalysis that showed I did not have a UTI, it became clear that I was possibly dealing with IC. According to ICAwareness.org, roughly 4 million Americans suffer from IC. Pain and pressure in the bladder and pelvic area. Sometimes this is so bad for me personally, I have to sit in a hot bath or hold a heating pad on my pelvis until it calms down. Urgency and frequency of urination, as often as every 10 minutes for some. My IC does get that bad sometimes. Lack of infection/negative cultures, despite exhibiting symptoms of a UTI. I do tend to get kidney infections at times. Nocturia (urge to urinate at night). Sometimes, during a bad flare-up, I have to go to the bathroom up to 5 times in the middle of the night. 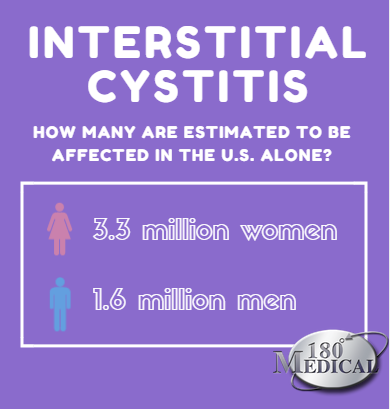 Interstitial Cystitis is a specialized condition, and while it will cause some common symptoms shared by many, the experience can be different between person to person. It’s difficult to tell someone else exactly how it feels, because one person may have symptoms that the other doesn’t (and vice versa). One person may have mild urgency with no pain, while someone else could have extreme pelvic pain, spasms, burning, and increased frequency of urination. Soak in a Sitz Bath or warm Epsom Salt bath. Place a heating pad onto your pelvic area to alleviate pelvic pain. Mix a quarter teaspoon of baking soda into a ½ cup of water, stir, and drink promptly. This calms the bladder. Make sure and check with your doctor if you take other medication. which adds a distinct citrus flavor without the bladder irritation. Drink as much water as possible. Water is the best thing for your body, especially those of us with IC. The spasms and other symptoms will eventually calm down after you flush your bladder. Drink chamomile or peppermint hot teas. They both have soothing effects on the bladder. Yoga can also be very relaxing and strengthening for some of the Interstitial Cystitis and Pelvic Floor Dysfunction (PFD) symptoms. When nothing alleviates your symptoms, see your doctor. Do not ever feel like you are an imposition on your doctor or their staff. That is what they are here for. The staff at 180 Medical is always available as well to answer any questions we can. If you are experiencing symptoms of Interstitial Cystitis, just know you are not alone in your personal journey.